Hello everyone, and welcome to another Singaporean watch review! This Sunday, we are taking a look at the Aquatico Pilot One. The Aquatico Pilot One Supercharger DLC Blue – retails for $250 USD on Aquatico’s website. Being mainly a brand that offers dive watches (therefore the name), the Pilot One is, as the name suggests, Aquatico’s aviation inspired offering. Let’s take a look and see if it’s any good! As far as I can tell, Aquatico is rather serious with its claim of offering professional dive watches. Both their diving series (Dolphin and Nautilus) offer watches with 3000M of WR! Even with the Pilot One, the WR is still respectable at 300M. The claim about competitive prices? Aquatico seems serious about that too. The Pilot One starts at a mere $210 USD, while the 3000M WR rated Dolphin and Nautilus starts at $380 USD and $450 USD respectively. In contrast, H20’s Kalmar 2 (also rated at 3000M WR) starts at $1038 USD, albeit with a Swiss ETA 2824 movement. Aquatico is mainly known for their dive offerings – let’s see how their pilot watch stacks up! For the most part, I do think that you’re getting a lot of tool watch for your money. Even at this price, we get sapphire crystal and a DLC coated case! Firstly, I’m heartened to see the usage of sapphire crystal (AR-coated) on the Pilot One. At the Pilot One’s low price range, it is not unusual to see manufacturers skimping on sapphire crystal, opting for mineral crystal or “sapphire-coated” crystal instead (DW, MVMT, Filippo Loreti). As aforementioned in my previous reviews, sapphire crystal is desirable in a watch due to it’s high resistance to scratches. The presence of an internal AR coating also negates nasty reflections, which may hinder legibility of the dial. In addition, we also get a DLC (diamond-like carbon) coated case on the Pilot One – another feature not typically seen in this price point! The result of this is that the matte black coating is more scratch resistant than it’s counterparts, which tends to use standard PVD (Physical vapor deposition) coating instead. Sapphire crystal + DLC coated case – so far, the Pilot One is living up to its tool watch billing! Inside, the Seiko NH36 movement powers the watch. The Seiko NH35 movement is probably the most common movement seen in cheaper microbrand watches – the NH36 movement is simply the no-date version. It’s a no-frills, reliable movement that should be easily serviceable by any competent watchmaker. Some specs: 21600 vibrations per hour, 42 hours power reserve, 24 jewels, and is hacking. Despite being presented as a pilot watch, WR rating is still a relatively high 300M, Although traditionally pilot watches shouldn’t have such a high WR rating (think about it – the only reason a pilot would need his watch to be water-resistant is if his plane goes into the water), in practicality I find the high WR rating more than welcomed – it meant I could wear it in the shower/pool/sea without worrying about it! The Isofrane-styled strap is rather nice too! Isofrane straps are perhaps one of the best dive watch straps that you will find. Despite Aquatico’s claims otherwise on their website, I don’t think that the strap is a genuine Isofrane strap (Isofrane straps retails for over $100 USD) – this is more likely an Isofrane-styled strap. A tell-tale sign would be how the Pilot One’s strap picks up a considerable amount of dust (as seen in the photo above), which is unlikely to happen to a genuine Isofrane strap. The buckle is DLC coated matte black as well to complement the case, which is a nice touch. While the strap is rather nice and comfortable on the wrist I do find the pairing of an Isofrane-styled strap with the Pilot One a tad odd. As mentioned earlier, Isofrane straps are meant to be taken for diving – that’s what they are designed and engineered for! Yet, the Pilot One is billed as a pilot watch, and as such I personally feel that a leather or canvas strap would have been more in keeping with the theme of the watch. The lume on the Pilot One is decent, though it’s apparent that the hands glow significantly brighter than the indices do. Unfortunately, the specific type of lume utilized here isn’t made known on Aquatico’s website. Overall, keeping in mind that this is a $250 USD watch, I think that the specs of the watch are great, definitely living up to the billing of a tool watch! An automatic movement, sapphire crystal paired with a DLC coated case – that’s a lot of value for your money. There’s also a non-DLC coated version of the Pilot One retailing at just $210 USD, which is less than the retail price of a Daniel Wellington! The design of the Pilot One is pleasing, but there are definitely room for improvement. The sunburst, sandwiched dial on the Pilot One. Let’s start with the positives. I rather like the sunburst texture of the blue dial – it really makes the color pop, as seen in the photo above. It just draws your attention in! The sandwiched indices creates depth too, as do the minute track printed on a raised ring that surrounds the dial. The crosshair dial adds a nice vintage touch to the Pilot One as well, and is an aesthetic detail rarely seen in current modern watches. The red tipped second hand adds a nice pop of color to the dial too, and I find the choice of a square tipped second hand interesting, obviously a conscious choice to reflect the square case of the Pilot One. I also find the usage of double-digits numerals intriguing, and sets the Pilot One apart from other watches, even aviation ones. In fact, in general I find the dial of the Pilot One rather nice, with the sole exception of the primary hands. Firstly, I don’t think the choice of blue hands is smart – there’s no contrast between the hands and the dial, hindering legibility, which is a key feature of aviation watches. Secondly, I find the style of the hands a tad too fancy for a tool watch. For some reason, they seemed to be shaped like fishes to me! The case is rather rough around the edges (literally). In my opinion, the case can be substantially improved. As seen in the photo above, the edges (of both the lugs and the case) are rather sharp, and lack any beveling or finishing at all. This gives the watch a raw and unfinished feel (as if this is a prototype instead of a production model), which I’m not exactly convinced that it’s intentional. The case of the watch in general just doesn’t seem refined. In addition, the lugs is disconnected from the case, and is held together by simply screws. From a durability standpoint, I’m again not convinced that the lugs wouldn’t chip or even break apart from the watch case due to wear and tear. Furthermore, because the screws on the Pilot One protrude, those screws (which mainly serve a mere aesthetic purpose) may chip off and break away over time. From a design standpoint, the case of the Pilot One simply feels a bit too raw and unfinished to me, and from a durability perspective, I’m really not convinced that it would survive the trials and tribulations of being an everyday beater watch. The case-side is actually quite intriguing, and we get a nicely signed and grooved crown. I find the case-sides rather interesting, and it adds dimension to the watch. It has a very industrial look, which fits the pilot theme of the watch well. I also like the contrast in texture and depth on the case-sides, which is an area where most microbrands neglect. The crown is nicely signed as well, and grooved nicely to provide good grip. In addition, the crown is screw-down, a prerequisite to achieve the 300M WR rating. The caseback artwork confuses me. The caseback itself is rather pedestrian, the only decoration being an artwork of a mermaid riding a dolphin. The artwork confuses me, as the watch is billed as a pilot watch – Aquatico named it the Pilot One after all. There’s no relevance between the caseback artwork and the watch. This caseback artwork would have looked a ton more appropriate on a dive watch instead. The caseback is perhaps indicative of the Pilot One’s confused identity – it’s meant to be a pilot watch, but several elements on the watch would have been better suited on Aquatico’s dive offerings instead. Overall, I liked some elements of the Pilot One’s design, but not others. The dial (with the exception of the hands) is interesting and overall nice to look at, but I find the case a bit too raw and unfinished for my liking. The caseback artwork also makes no sense for a pilot’s watch, and exemplifies Aquatico’s confusion about the identity of the Pilot One. 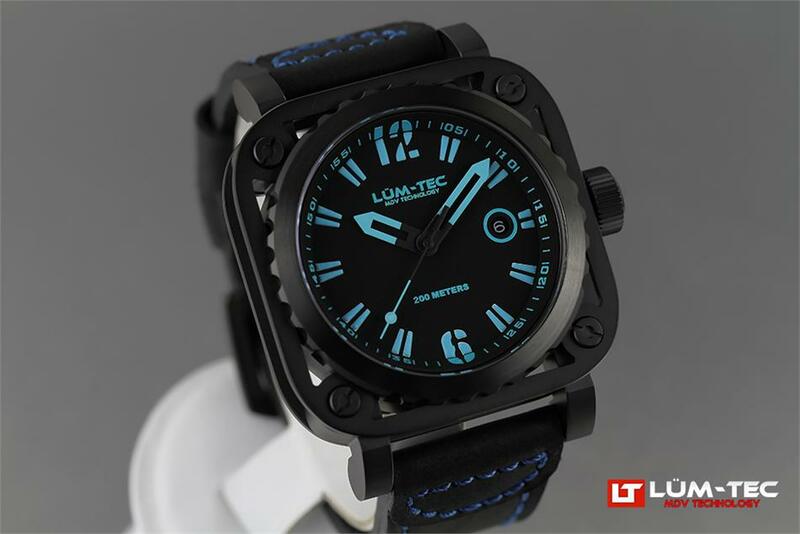 Lum-Tec can be considered one of the forefathers of microbrand watches, and specialises in tool watches with strong lume. Their G6 looks pretty similar to the Aquatico’s Pilot One watch, and therefore forms the natural competition to the Pilot One for today! The Lum-Tec G6 retails for $455 USD, available on their website. Spec-wise, I would say that the Pilot One, despite being half the price of the G6, actually has the better specs. They both use sapphire crystal (with AR coating), but that’s where the similarities stop. The Pilot One has better WR rating (300M to G6’s 200M), a DLC coated case as opposed to PVD on the G6, and most importantly, is automatic, while the G6 uses a Swiss Ronda Quartz movement. To some, the fact that the G6 uses quartz would already be a deal-breaker. In the G6’s defense, it does have stronger lume (the brand is called Lum-Tec for a reason) than the Pilot One. In terms of design, I’m afraid the G6 takes it by miles. There’s a reason why Lum-Tec survived as a watch microbrand for so long – a lot of it can be attributed to how they nail their design. The dial on the G6 makes much more sense as an aviation watch – numerals and indices are plain and almost utilitarian, the hands stark, nothing fancy – overall, the dial on the G6 is designed to be as legible as possible. In contrast, the dial on the Pilot One (while eye-catching) is in my opinion a bit too flashy for a pilot watch. Both watches also shares similarly designed cases, but one look and it’s evident that the case on the G6 is much better finished than the Pilot One. The edges on the G6’s lugs are beveled and rounded off, while the screws on the bezel don’t protrude as much as those on the Pilot One. The edges on the case of the G6 are also rounded off, as compared to the sharp angular dimensions on the Pilot One. Again, this might be aesthetics (perhaps Aquatico wanted to go for a more raw look), but as mentioned earlier those sharp edges are prone to chips and scruffs, and from a durability standpoint I’m betting my money on the G6 over the Pilot One. That being said, the biggest asset for the Pilot One is probably its price. At $250 USD ($210 USD for the non-DLC variants), it’s half the price of the Lum-Tec G6. Yes, you heard that right – an automatic watch is half the price of a quartz! At $455 USD, I do feel that Lum-Tec should have included an automatic movement in the G6. As well made as the G6 is, I personally find that the price tag is a bit too high, especially for a quartz watch. As such, from a price to quality perspective, the Pilot One is the winner in this shootout for me as its low price points makes some of its flaws more palatable. That being said, if you don’t mind quartz, and the price tag is alright with you, the Lum-Tec G6 would probably be a watch that can last you a long, long time. Conclusion – So the Aquatico Pilot One “shiok” or not? The Aquatico Pilot One is not without its flaws. The case should have been finished better, and the watch seems to suffer from an identity crisis on whether it’s a dive watch or a pilot watch. That being said, if you can look past those flaws, the value proposition here is tempting. One must remember that the Pilot One retails for $250 USD ($210 USD for the non-DLC variants) – with such a low price, expectations must be checked. If you’re looking for an affordable, fun watch for the weekend, put the Pilot One on your shortlist. If you’re specifically lusting for an affordable square watch, then I would say the Pilot One is a no-brainer. It does look good on the wrist! Ultimately, my opinion is this: if you like the design of the watch, get it. If you’re interested in getting one, the link to Aquatico’s e-store is here. You certainly can do much worse for $210-250 USD! Update: Since posting this article, Carlos (founder of microbrand Prometheus, who’s married to Maria, founder of microbrand Borealis) have claimed that Calvin of Aquatico “stole” the design of one of Borealis’ models. The article covering this saga can be read here. Personally, I do not have enough information on this saga to come to an informed conclusion, and thus will reserve judgement out of respect for both parties and brands. Ultimately, it’s up to you guys, the readers and the consumers whether such issues will hold you back on your purchase. Previous articleFeature: Affordable dress shoes in Singapore! Hi Tony, please contact me at qile@wahsoshiok.com. Thanks! Thanks for your reply and sorry I take so long to reply you….just that I did not get any alerts….will contact you again sometime soon.Have a great day ahead.